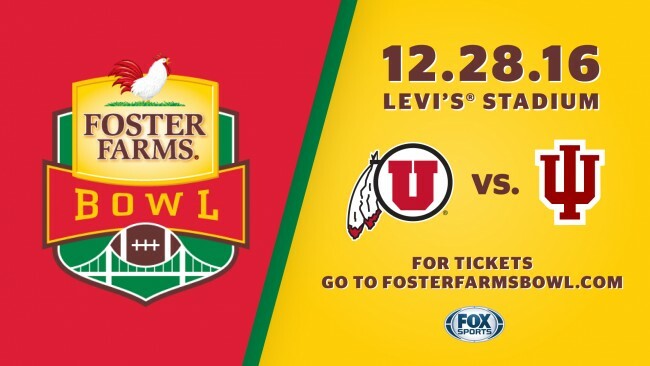 The Foster Farms Bowl is an NCAA-licensed, Post-Season College Football Bowl game playing its third game at Levi’s® Stadium featuring Utah and Indiana. It will be the only post-season Bowl game televised by FOX Sports in 2016. The game is entering its 15th year and is now owned and operated by the San Francisco 49ers. Tickets are available now and start as low as $25. If you are interested in general tickets or luxury suites for this event, please call 415-GO-49ERS, ext. 3 or email premiumhospitality@49ers-smc.com. All representatives of the media planning to cover the Foster Farms Bowl must submit his/her credential application no later than Tuesday, December 20, 2016. No credential applications will be processed after December 22, 2016. Applications may be filed individually, or on behalf of an organization by the sports editor, news assignment editor, broadcast sports director or other appropriate supervisor. Approvals or denials will be sent as soon as the evaluation of the application has been completed. 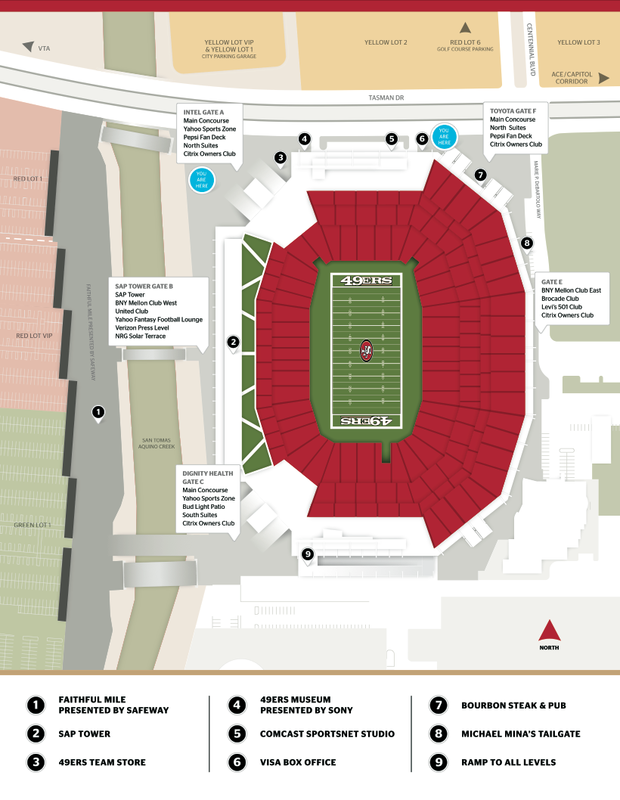 We ask that all guests attending the game, please review the stadium event guide prior to your arrival. Player-Guest Will Call for each school will be located at Toyota Gate F and opens at 2pm. The Visa Box Office will be open at 2pm and is located at the north end of the stadium inside Toyota Gate F.
Secure a pre-paid parking pass in advance via the Levi’s® Stadium app or Ticketmaster. Did you know you’ll receive a $10 discount off the standard purchase price if you buy in advance? Parking lots are scheduled to open at 2pm on event day. All guests must be in possession of a valid event ticket, pass, or credential to park in a designated parking lot. Cash lots (day of event parking) will be made available on a first-come first-serve basis. Prices vary per lot and will be $10 higher than if purchased in advance. For this game, the following parking lots will be open for cash payment: Red Lot 1 and Blue Lot 1. 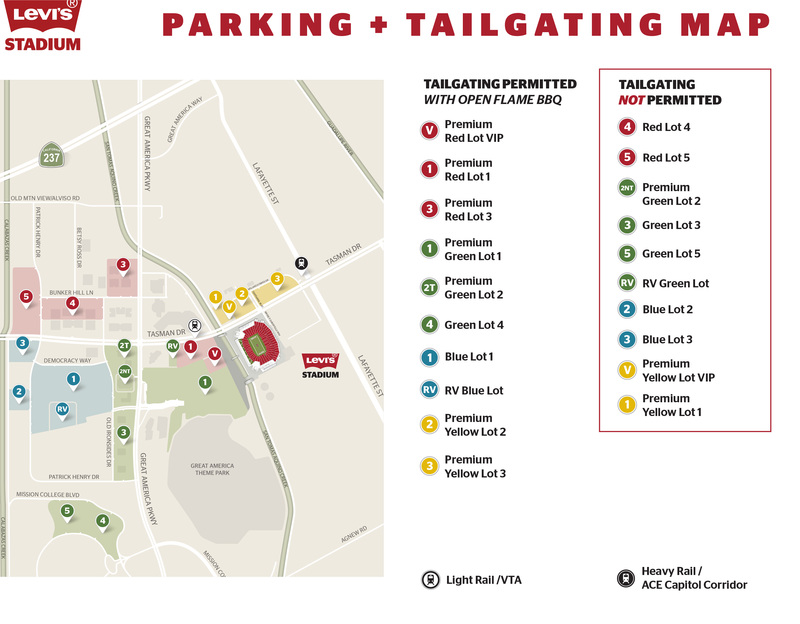 Mobility services will be onsite at 2pm to provide roving carts throughout Red Lot 1 for assistance to stadium gates. In addition, Bauer buses will provide shuttles from Blue Lot 1 to Dignity Health Gate C.
Bicycle parking will be located outside of Intel Gate A pedestrian bridge. All ticketed guests will be permitted the use of the San Tomas Aquino Creek trail beginning at 2pm. The Silicon Valley bicycle coalition will be administering this operation. 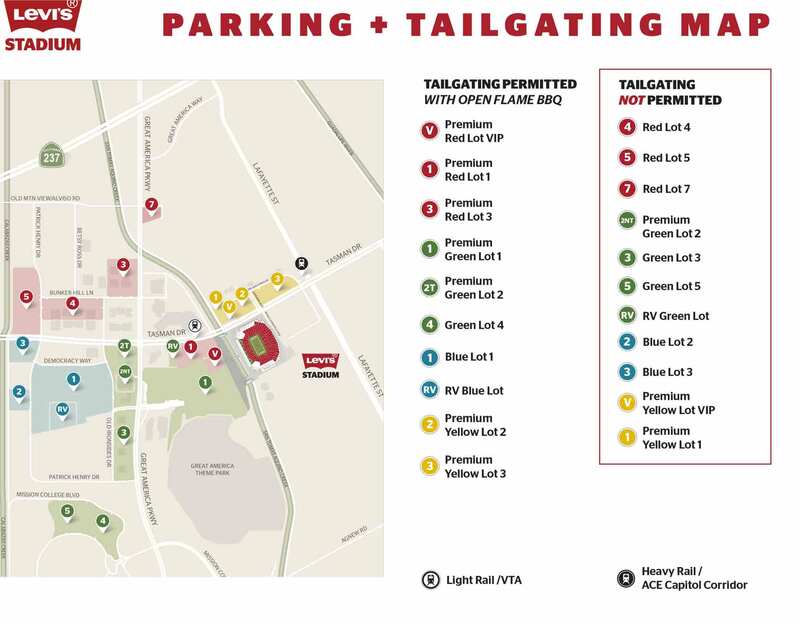 Buses/oversized vehicles or Charter Buses that do not wish to tailgate must park in Red Lot 1 and purchase parking in advance by contacting the Visa Box Office at 408-579-4449. You can also purchase parking through the Levi’s® Stadium App. Purchase pre-paid parking passes in advance on Ticketmaster.com or on the mobile app as prices increase by $10 on event day. Tailgating is permitted in specified areas only. Non-compliance may result in ejection from the lot without compensation. Tailgating will cease after the game starts. All accessible parking will be directed to Red Lot 1. Guests who possess a valid placard will be directed to park in Red Lot 1 and must display their placard at the entrance to be admitted. For fans riding ACE trains, VTA Buses, Capitol Corridor trains, taxi or rideshare, Uber or who have parked in Yellow Lots 1, 2, 3 should exit via Toyota Gate F.
View Utah and Indiana’s pregame warmup from the field with one guest, watch the teams hit the field from the players tunnel before kickoff or run on to the field and take the tee after the opening kick. Keep the memories alive forever with Golden Opportunties. If you’re interested in group tickets or suite rentals for this event, fill out the form below or contact us at 415-GO-49ERS, ext. 3 or premiumhospitality@49ers-smc.com.